Wareham Cemetery, Wareham, Dorset, U.K.
Patrick was born in Ballymahon 6 November 1891. He enlisted in the Leinster Regiment Special Reserves when he was 17 years old in 1909; he was mobilised to permanent service on the 4 August 1914 serving in France from December 1914 until the January 1916. He completed his period of engagement 31 January 1916. 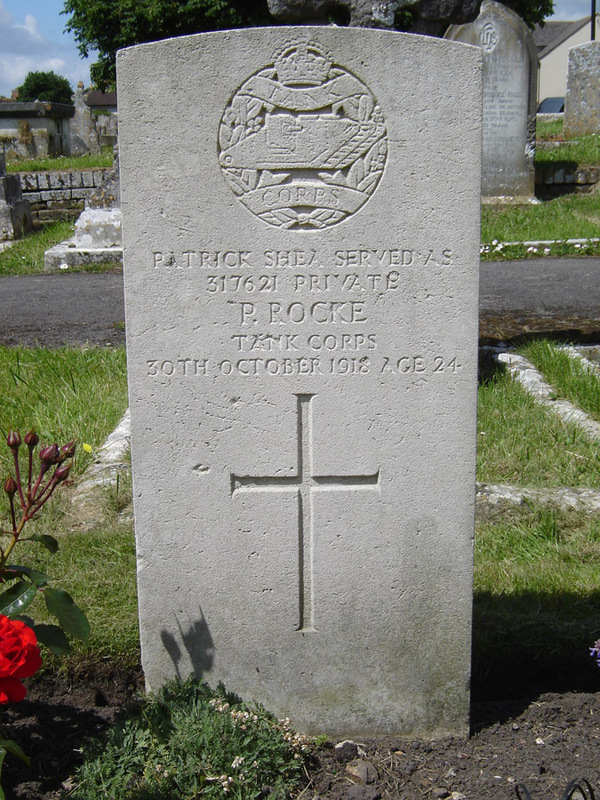 After this Patrick re-enlisted in Dublin in the Tank Corps under the name Rocke, although some records list him as Roche. He reenlisted in Dublin using his assumed name, on the 11 October 1918, however, he died in Wareham Military Hospital a few weeks later. His sister, Mrs. Margaret Clarke of Creevaghbeg, was listed as his next-of-kin. Son of John Shea and Mary (née Nolan) of Ballymahon, Co. Longford. Brother of Maggie, Ellen, Annie and Patrick. Maggie was married to John Clarke by 1911. Wareham Military Hospital was a 45-bed unit at Wareham military base.